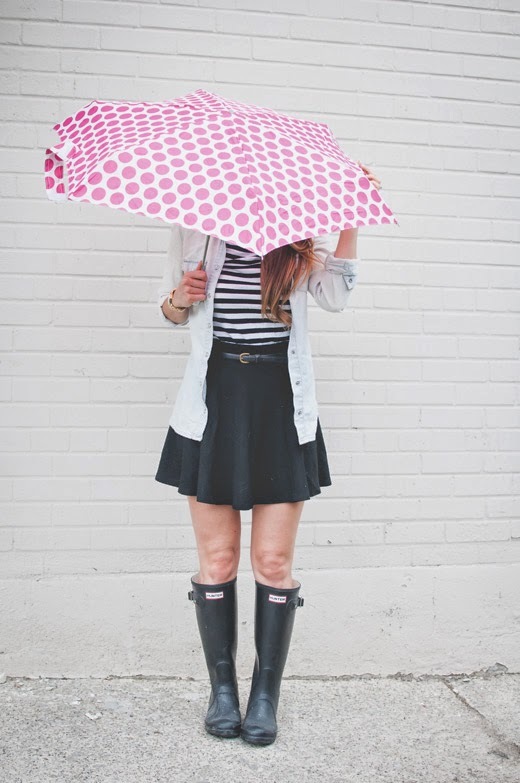 OOTD - Rainy Day Outfit Featuring Hunter Boots | La Petite Noob | A Toronto-Based Fashion and Lifestyle Blog. 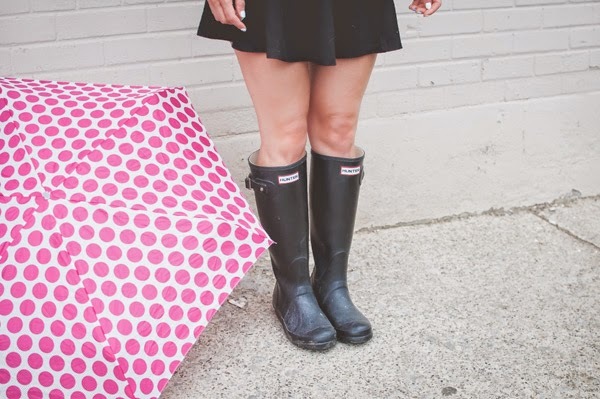 I really love my hunter boots - or just big rain boots in general. Nothing makes me feel as invincible as charging through a huge puddle in these boots and staying dry. These Hunter boots get a lot of use on rainy days, usually paired with a skirt - with or without tights, weather depending. Short skirts are my go-to for damp weather, for the simple fact that they do not drag on the ground and get wet. How do you like to dress for a rainy day? I love my Hunter Boots as well. I even wear them all through winter (with thick socks mind you) to combat the slush. I definitely sport layers when it rains, because it gets super sticky here in the summer. I am definitely going to start wearing mine through the winter as well - especially if next winter is anything like the last! Such a cute outfit! I would love for you to write which lipsticks you wear in the section wear you list out your clothes. Your lipcolor is always so fun! 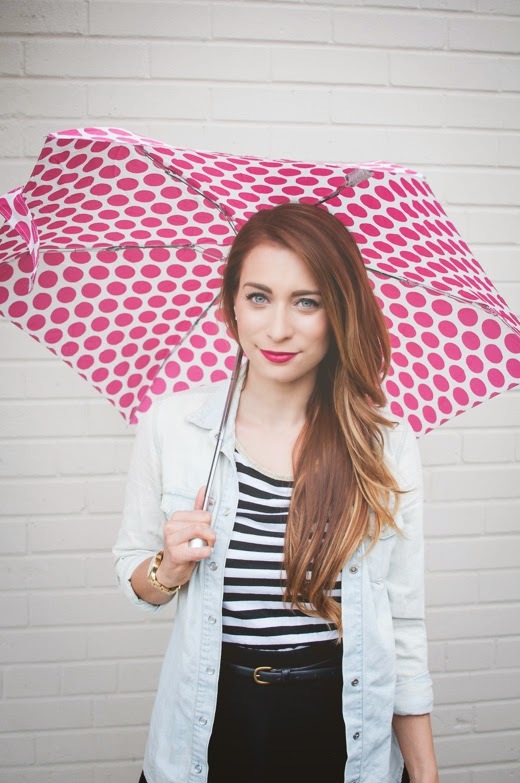 You look very cute and stylish in the rain :) Love the umbrella! Thank you, I love this umbrella too! Makes me almost enjoy the rain... almost. Thanks Carsla, great to hear from you! I love your outfit, Hunter Wellingtons are a must when it's raining, I've just bought a pair of lovely glossy violet Huntress Ladies Wellingtons and wear them nearly every time I go out. I bought my Wellingtons on eBay, they are brand new and didn't cost a fortune and there are a vast amount of colors to choose from, I'm thinking of buying a pair in glossy black for everyday wear such as going to work or shopping on a wet day and keeping my violet Wellingtons for best. Great recommendation! I have been eyeing a pair of pink boots - something bright to cheer me up in the rain. I like the idea of white boots as well, really clean. I would go with pink, the color really pops and you could do so much with them. Idk if you wear polos much but a pink polo and white pants would blend really well together.